May our Lord God bless you richly today as we celebrate Christ’s birth. I have a dream–A dream of living with my family in the woods in a tiny home. 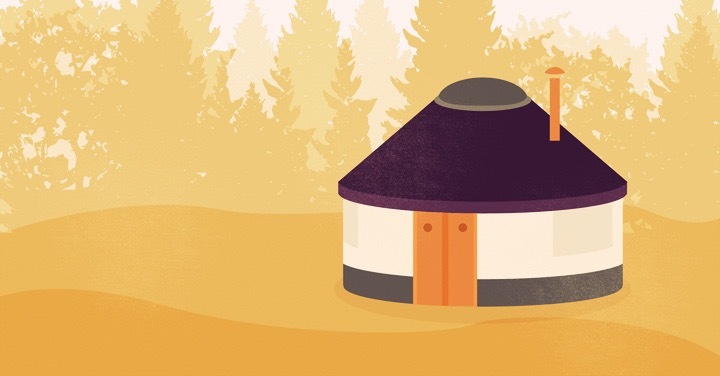 Ideally, that tiny home would be a yurt. I love yurt life, and wanted to share this article with you. Enjoy! So, I lot of things have been going in, but not really. Have you ever been at a point in your life where you feel busy, but not with the important things? That’s where I feel I am right now. But, that’s okay. Everything is a season. I’m prayerfully considering my next steps for 2015. Where to go. What to be. What to concentrate my time on. You see, I don’t want to do things–dare I say–half-a$$ed anymore. Sorry for the vulgar statement, but I don’t know another way to word it. I want to be free and honest with y’all. I’ve spent too many years of my life trying to seek others approval, trying to be more than I am, and trying to do too many things at one time. So along with getting rid of most of my stuff, I will also give up most of my obligations. I want to do all things as for God, which to me means with excellence, or at least trying my best and knowing I put forth my best effort. When I have too many things on my plate, I don’t do anything well. So with that, I’m praying. Praying for peace for you and me, and praying that 2015 is our best year ever! God bless, y’all! Remember, it is never too late to start what God has for you. Start it now! What if when you wake up tomorrow, you only have what you thanked God for today? I have so many things I am thankful for, and have been talking to God about it all day. Enjoy your day, folks. May God open the doors of thankfulness upon you. Be blessed! A blast from the past. Wow have things changed since this post. Sometimes God needs to remind us of our past prayers so we can realize how blessed we are in the present. My heart is full and grateful, Lord. THANK YOU! But, I don’t think we will have to wait too long. Our adoption worker said she would type everything up, submit it to her boss, and then we should receive the final word in two weeks.